Katherine Hubbard, Untitled (opposing sight no.1), 2014, silver gelatin print, 30 x 40". 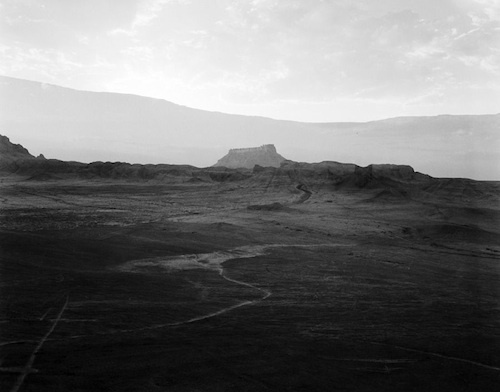 “Four shoulders and thirty five percent everything else,” is a series of black-and-white gelatin silver prints of images shot within the desert landscape of southern Utah. Some pieces contain two, three, or four photographs in one print, three to five inches across or so, clustered together and bordered by the thick black of fully exposed photography paper. They were taken in an area marked by sight lines that delineate the field of vision between two facing cameras. Hubbard’s body moves throughout the picture planes, standing up, lying down, dressed, partially undressed, present, and absent. By transferring her body from her queer New York milieu and setting it against the backdrop of southern Utah, where society does not weigh so heavily on what our bodies can and cannot do in space, Hubbard recuperates alternate narratives and new possibilities for the body. The photographs are miniature, but Hubbard’s presence in the frame creates scale, communicating the vastness and stillness of her surroundings in relation to her lithe movement. In one triptych, Four shoulders (the size of it) (all works 2014), the artist faces in three directions, one per image, and her arms are outstretched as if holding up an imaginary piece of paper or framing a future photograph. Her full arm extension is swallowed by the desert without so much as a thought, a position punctuated by several other key works, namely I/eye, a forty-by-fifty-inch gelatin silver print of an endless noonday Utah landscape with a tiny, spindly black camera on a tripod in the center, as insignificant as it is jarring.